Dry roast the semiya/Vermicelli till golden brown and set aside. In a thick bottom pan add two two cups water and one cup milk and get it to boil. 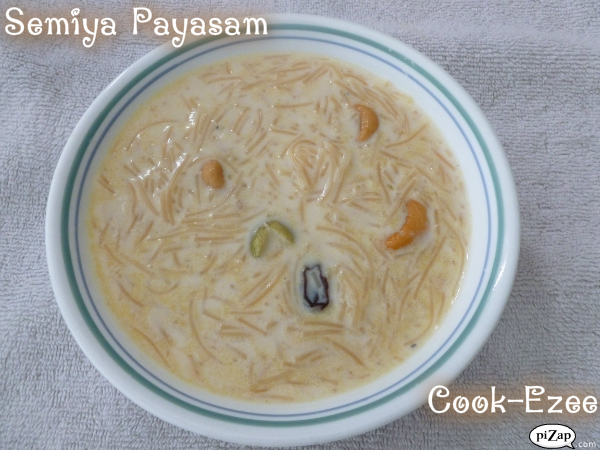 Add vermicelli/Semiya to it and stir continuosly till semiya is soft and cooked well. Add the crushed cardamom powder anto the payasam. Note:- If you buy the roasted, opt out from roasting the vermicelli. You can adjust the sugar according to your taste.